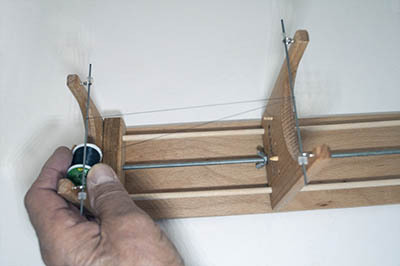 Illus­trated step-by-step instruc­tions to get you started bead­ing on The Ricks Bead­ing Loom. Step 1: Install warp rods. Remove the rub­ber cap from one end of a rod, place the rod through both screw eyes on the inside of the tail­stock and replace the rub­ber cap. Repeat these same steps to install a rod on the head­stock. Note: There is one extra rod as a spare. Deter­mine the length of the body of your project. For a bracelet, that would be the length with­out any taper­ing on the ends or a clasp. Loosen the tail­stock adjust­ment wingnuts and slide the tail­stock in or out to the approx­i­mate desired posi­tion. Lay a ruler on the warp rods. Be cer­tain to mea­sure from the out­side of each warp rod. Turn the appro­pri­ate wingnut until the tail­stock is prop­erly posi­tioned. 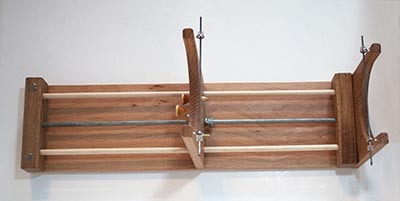 To hold the tail­stock in place, tighten the wingnuts until they are pretty snug. Note: The warp thread is the thread that run length­wise on the loom. The weft is the thread that runs lat­er­ally and holds the beads. Insert the peg into the sec­ond (from left) hole in the headstock. Unless you are using a very large spool of thread or reel of Fire­Line™, you can keep the thread on the bob­bin or spool. 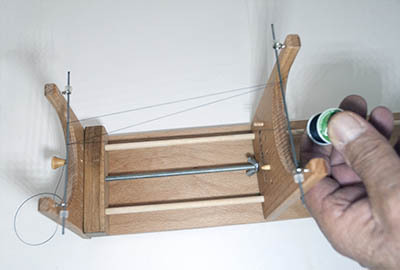 If the spool (or reel) will not fit under the warp rod, cut off enough warp­ing mate­r­ial to warp the loom. The amount you cut off will, of course, depend on how wide and how long your fin­ished prod­uct will be. Pass the thread OVER the head­stock warp rod and around the tail­stock rod to cre­ate the first warp, next back UNDER and around the head­stock warp (sec­ond warp), and then OVER the tail­stock rod (third warp). Repeat until you have placed the required num­ber of warps on your loom. Remem­ber you will need one warp MORE than the num­ber of beads in the width of your project. For exam­ple, if your project is eight beads wide, you will need nine warps. 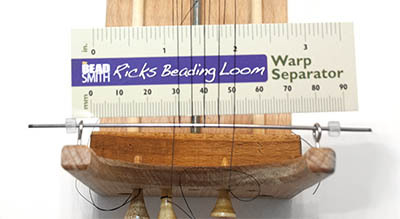 The last warp thread MUST go over a warp rod, so if it looks like your last warp should be under the rod, go over the top any­way! NOTE: With an even num­ber of warps, you will end on the head­stock, and with an odd num­ber of warps, you will end on the tailstock. After you fin­ish cre­at­ing the warps, attach the end of the thread to another warp peg as you did in step 3 and insert it into a peg hole below it. NOTE: When wrap­ping the warps around the warp rods, do not allow them to become tan­gled and keep a fair amount of ten­sion on the warps. After you attach the thread to the peg, you can adjust the ten­sion by turn­ing the peg (before you insert in the hold very tightly) , much like tun­ing a stringed instrument. In your kit you will find a plastic-coated card called a “warp sep­a­ra­tor.” (Note: If you ever lose your warp sep­a­ra­tor, half of a busi­ness card — or bet­ter yet, half of an old play­ing card — will work just fine.) Take the warp sep­a­ra­tor card and place it OVER the left­most warp (which should be com­ing over the top of the warp rod), then UNDER the next warp, over the next, and con­tin­u­ing on until you have passed over and under all of your warps. Slide the warp sep­a­ra­tor back against the head­stock rod.